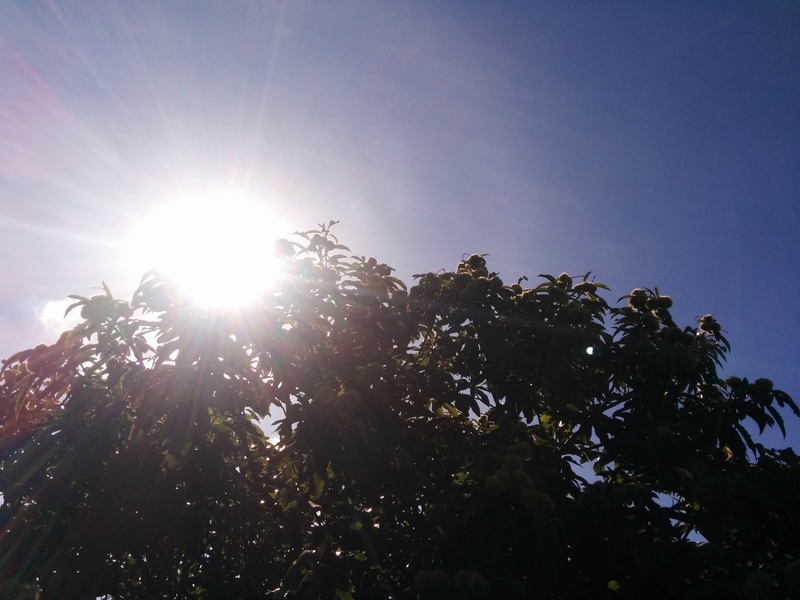 It’s autumn here in Hobart, though you could be forgiven for thinking it’s still summer at the moment! The sun is shining and the tomato harvest seems to be stretching on and on this year. The deer season opened in Tasmania a few weeks ago and, while I object to shooting a living creature just because you can, I have no problem with hunting if the animal is killed humanely and all the carcass is used. I was gifted a shoulder of venison last week by family members who hunt. One deer provides a lot of meat shared throughout the clan, including mince and home-made sausages as well as the usual roasts and stewing pieces. I took my my shoulder home and wondered how I was going to use it. As I walked in the kitchen, I spotted the dehydrator (it’s hard to miss!) still out on the bench after drying all the prunes this year, and made up my mind to try some jerky. 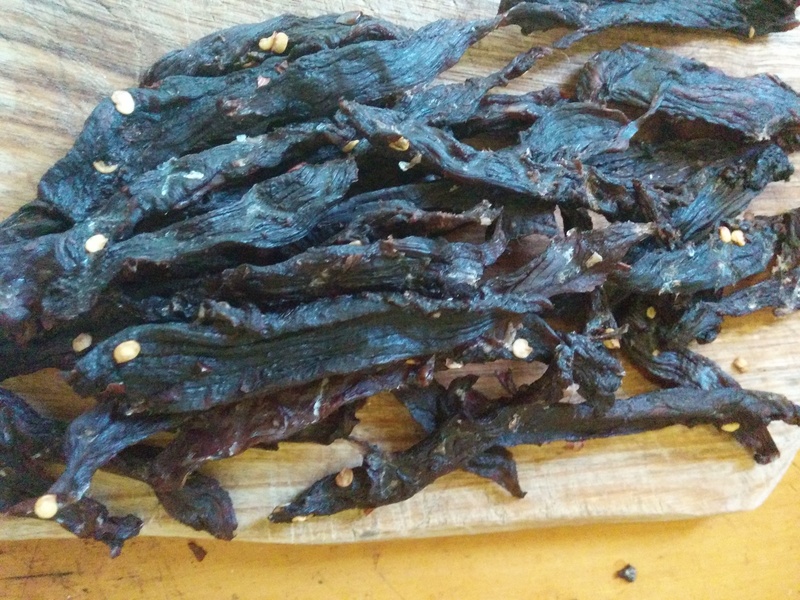 I haven’t made jerky in a dehydrator before (only on a Weber barbecue) so this was quite an experiment for me! Boning out the shoulder took some time, but with a good knife, some fine music and podcasts to listen to, I was pretty happy. The trick is to cut with the grain of the meat and remove as much of the sinew as possible along the way, but the end result is worth it. Also, instead of wasting all those bits of sinew, I got a stockpot out with a head of garlic, a roughly chopped onion, a few bay leaves, my homemade Tuscan seasoning and some dried celery leaves. Once I finished boning out the shoulder, I added the bones, covered it all with cold water and wine and let it simmer for hours. The next day I skimmed off the fat and let it simmer again for a few more hours. Once it had cooled, I strained the remaining liquid and it was absolutely wonderful. I’ve potted it up and frozen it for rainy day soups, casserole and risotto bases. In the meantime, back to the jerky. I peeled the garlic and started chopping it. Once it was reasonably small, I sprinkled the salt over it and, using the flat of the blade, really started the mash the garlic. I got out my biggest plastic lunchbox with a tight sealing lid and put the salty garlic mash in the bottom with the sugar and chili flakes. Then I added the wet ingredients and carefully mixed the whole thing. Adding the venison strips was a messy business, you really need to use your hands to massage the mix into the meat. Finally, I covered the container and put it in the fridge overnight. I did squish it around some more before I went to bed, but it isn’t really necessary. The next day, I put thin strips of marinated venison on the dehydrator trays and lovingly placed them in the machine. The smell was gorgeous and I think this marinade would make a wonderful stir fry or slow casserole too. Using vinegar and the high salt content of both the soy and Worcestershire sauce did a great job and really drew out a lot of the moisture content from the meat as well as flavouring the strips. To start, I put the temperature up high on the dehydrator (74 C/165 F) for the first half hour. This is recommended because I don’t use a nitrite “cure” for the jerky and it is necessary to kill off potentially nasty bacteria before drying proper. Botulism is dangerous and I take food safety seriously. Then I brought the temperature back to 63 C/145 F and processed it for just over 6 hours. This will vary with different dehydrators. The results were excellent – chewy, delicious, dark and spicy! I’ve bagged it into little packs and for extra safety, will keep it in the freezer and pull out some as needed. I’m going to try this with other meats (especially cheaper cuts of beef and rabbit) but the cider vinegar and salty soy combo is certainly worth repeating.